The AMX M4 mle. 45 is a French tier 7 heavy tank. El desarrollo de este carro pesado empezó en 1945. El vehículo incorporaba varias características de diseño del Pz.Kpfw. VI Ausf. B Tiger II. Solo existió en anteproyectos. Más tarde, el AMX M4 (1945) fue un prototipo del AMX 50 100. The AMX M4 45 can be considered an evolution of its predecessor play-style. It uses the same guns as the ARL 44, which are less outstanding for its tier, but with improved rate of fire, accuracy, and aim time. Although the M4 45 sports better track protection, its overall armor is weaker than the ARL 44's, and very poor for its tier. However, it receives fairly good mobility for a heavy tank in exchange, and is fairly effective in a supporting role, setting the pattern for future French heavy tanks. The AMX M4 mle. 45 leads to the AMX 50 100, and the AMX 65 t.
The M4 45 plays similarly to its peer, the Pz.Kpfw. VI Tiger. 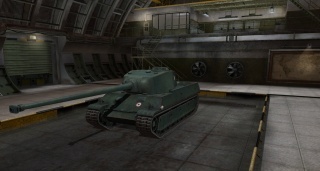 Compared to the Tiger, it receives slightly better frontal armor, somewhat more powerful guns, better gun depression, and a better power-to-weight ratio in exchange for much worse side and rear armor, generally poorer soft statistics like rate-of-fire, terrain resistance and gun dispersion, and a much lower health pool. Therefore, it is very important to avoid taking fire at all times and to a greater extent, avoid being spotted. The AMX M4 45 must make the most out of its improved cannon to stay competitive on the battlefield. Furthermore, getting used to poor armor and assuming a supporting sniper role will help very much in preparing players for the AMX 50 100 and the similar vehicles that follow it. The 90 mm DCA 45, 90 mm F3, and 105 mm Canon 13TR were previously also available on the ARL 44, and on the M4 1945 receive generally better characteristics. However, with the tougher opposition faced by the M4 45, APCR will be needed with the latter two guns. The DCA 45's outstanding penetration is generally sufficient with AP, even at Tier 7. With its powerful engine, the M4 45 is fairly mobile for a heavy tank, although the poor top speed and reverse speed can be disappointing, especially with its poor armour. The turret is somewhat stronger than the ARL 44's, but the hull is significantly weaker. Artillery is very dangerous for the M4 45, although the good gun depression and decent mobility go a long way towards helping limit its exposure in combat. As stock, you should be able to equip the first engine upgrade, the radio, the 90mm F3 and/or the 105 mm Canon 13TR, as they were available on the ARL 44.
b) Skip researching the suspension and equip Enhanced Springs. Research and equip the turret. Research or just mount the 90mm DCA 45 (if previously researched from the ARL 44). Finally, research the radio if you hadn't previously done so. Despite having one of the largest tank forces in the world (second only to the USSR), the end of World War II saw French Army left with no modern heavy tanks comparable to those of Germany, the other major Allied powers, or the USSR. The most modern and capable tank available was the ARL 44, which had been developed secretly during the German occupation, but it was realized that the design itself was obsolete and could hardly be compared to contemporary heavy tanks. 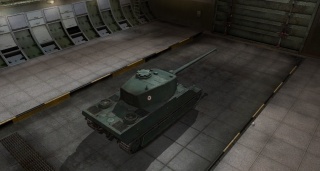 Thus, in March 1945, the French industry was invited to submit proposals for a modern heavy tank. 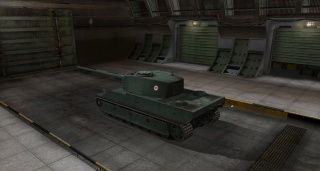 One of the companies to submit a proposal was AMX (Atelier de Construction d'Issy-les-Moulineaux) with the Projet 141 (Project 141), which proposed to build a heavy tank armed with the same 90 mm DCA 45 as the ARL 44, known as the M 4. The M 4 externally resembled the famous German Pz.Kpfw. Tiger Ausf. B (better known as the "King Tiger") heavy tank, but in order to limit the weight to the desired 30 metric tonnes, the M4 was considerably smaller, and had a maximum armor thickness of just 30 mm. The French engineers also elected to copy the overlapping road wheels that characterized German tanks designs of the latter half of the war, even though the principal motivation behind the Germans using this was because of the shortage of high-quality rubber. This required large road wheels to lower tire tension, and the overlapping design helped better distribute the weight of the tank. France had no such problems, thus making this feature superfluous, in addition to being quite maintenance-heavy. Part of the M4 project was also to study the feasibility of using leaf or coil springs instead of a modern torsion bar suspension in order to achieve a lower vehicle height (by 10 cm). The French Army ordered two M 4 prototypes, but quickly decided that 30 mm of armor was unacceptably thin for a modern tank. In response, the armor thickness was increased. Eventually, it was decided that a new oscillating turret designed by FAMH would be fitted instead of the originally-proposed welded conventional turret, and the first prototype was delivered under the designation AMX 50. 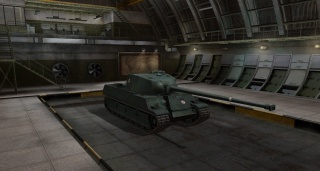 The AMX M4 ingame depicts the originally-proposed M 4 tank. No prototypes under the original M 4 specification were ever produced. 1945 CHAR AMX M4 at chars-francais.net Photos, specs, and brief history in French. Esta página fue modificada por última vez el 25 oct 2016, a las 12:57.